Another busy season of travel, both personal and client, for both of which I am always grateful! I've made my first extended visit to Japan, attending ILTM Japan (International Luxury Travel Market), a new luxury travel networking meeting; I realize now why Tokyo and Kyoto are such popular destinations today. We followed that with a week in New York, staying at the trendy Gramercy Park Hotel, in a city that always has something new to discover. While there, I took the time to inspect ten of the most recent openings in a city that never stops adding new luxury hotels. Team Kershaw has just returned from the annual Virtuoso TravelWeek in Las Vegas - just us and 4000 of our closest friends and colleagues. Now, perhaps a month or two enjoying our new ocean-front home on Vancouver Island, watching eagles and whales, before returning to France for my annual trip to ILTM Cannes in December. It's a busy life, and I love doing it, all to ensure you have even better travel experiences! Are you getting the most out of your hotel stays? Sabre has just introduced TripCase as a replacement to their familiar Virtually There itinerary reporting program. Although TripCase comes with a mobile app, you may access all your information without downloading any app. To quickly see your itinerary from your email notification of your itinerary, please click on the link in the upper right of the email message: Print Itinerary. In fact, you should do this, as only this version (not the one imbedded in your email) has all the travel segments, including transfers and phone numbers and such. For your eInvoice, click on your name under "Travel Documents" link, in the top right area of the email, then click on the invoice(s) you'd like to see. Easier than ever! Let me know if you have any questions. Sol Wave House (@SolWaveHouse), which opened a year ago on the Magaluf Beach of Majorca, has launched a virtual community called #SocialWave that guests can use to share pictures and texts. The hotel sees the community as a fun and interactive extension of what guests are already doing on their vacations - showing off their trip using social networks like Facebook, Twitter, Instagram. At this "party hotel," guests can communicate and tweet to each other by logging in via Twitter to a specially designed web application that's only available via the hotel's WiFi. Inside the network, guests can share pictures, send private messages, browse users' Twitter avatars to see who's online and where they are in the hotel. Our last annual reunion cruise, with AmaWaterways on the Seine from Paris into Normandy, was an outstanding success, measured by the both the amount of Champagne our group went through, and by the number of cabins the group booked on our next reunion: Christmas Markets 2014. We start with two or three nights in Prague, from December 6 or 7, then a week cruising the Danube from Nuremberg to Budapest, Dec 9-16, 2014, visiting the finest of Europe's legendary Christmas Markets in towns and villages along the way. This is the only group that I personally host. And AmaWaterways has just been awarded the Best River Cruise Line award at the annual Virtuoso TravelWeek. Only the best for my clients! Remember: One of the benefits of allowing me to book your travel is the elaborate set of alarms that ring at all hours of the night and day in my vicinity that are scheduled to remind me to check for an available upgrade on your flight, at the precise minute your flight becomes eligible. Now, go back to sleep. Team Kershaw is on it! Opening October 2013, Rosewood London will embrace guests within one of London's most historic locales, where the City meets Covent Garden and the West End on High Holborn. The early 20th-century Edwardian, Grade II listed building will offer a true sense of the destination, combining English heritage with contemporary sophistication. Guests will enjoy a central location with proximity to premier shops, theatres, museums and the major business and financial district, with traditional Rosewood spacious guestrooms and suites, fine dining, a luxurious spa, fitness centre, and impeccable, individual service. Global Entry is a U.S. Customs and Border Protection program that allows expedited clearance for pre-approved, low-risk travelers upon arrival in the United States. Though intended for frequent international travelers, there is no minimum number of trips necessary to qualify for the program. Participants may enter the United States by using automated kiosks located at select airports. Travelers must be pre-approved for the Global Entry program. All applicants undergo a rigorous background check and interview before enrollment. The process takes several months, so don't delay. Even if you only stay once at a Fairmont property, for example, membership in their Presidents Club gives you complimentary Internet, free local calls, shoe shines, and discounts at the Fairmont Store and spa. Shangri-La's Golden Circle membership rewards you with points for everything you spend on room, food, and services at Shangri-La, which in turn can be redeemed for rooms, spa treatments, etc. InterContinental's IHG Rewards Club offers complimentary Internet, and points redeemable for rooms and upgrades. The IHG group includes Holiday Inns, Crown Plazas, and others. Earn Marriott Rewards also at Ritz-Carlton, Renaissance and Hertz, and spend them on rooms, cars, or even sports tickets. Or convert your points to airline programs. Hilton HHonors points are also earned at Waldorf Astoria, Doubletrees, Hampton and Homewood properties and, according to your membership level, can even get you free bottled water in your room (limit 2 per stay). Starwood Preferred Guests earn points at Meridien, Aloft, Westin, Sheraton, St Regis, and Luxury Collection properties and provide guaranteed room availability, upgrades and free nights. Omni adds complimentary morning beverage delivery to free Internet and other perqs. Wyndham (including Ramada, Days Inn, Howard Johnson, and more, plus points from Avis, Budget and Sixt); Choice (with Clarion, Comfort, Quality Inn); Accor (incl Sofitel, Novotel, Mercure, Ibis and Pullman); and Best Western. Home Inns, the 9th largest chain in the world, operates only in China. And coming in at 10th place is The Rezidor Group, with Club Carlson for guests of Regent, Missoni and Radisson brands. Four Seasons is set to launch their loyalty program by the end of this year. And while stays at Orient-Express hotels don't garner points, you can redeem your Marriott Rewards at O-E properties. Sir Rocco Forte has stayed out of the points game with his chain so far, but even Israel's luxury Dan Hotels, through their e-Dan Club, offers 12.5% discounts to members for food and extras, from your very first visit. Virgin Galactic has completed another successful milestone that moves commercial space tourism closer to reality. On July 25, Virgin Galactic's spacecraft, SpaceShipTwo, made a safe, successful landing under the blue Mohave sky. This was one of a series of unpowered glide flights taking place alongside the rocket motor-powered test flights. The purpose of these flights is to do further engineering evaluation. They also form an important part of the training program for Virgin Galactic pilots. The glide flight achieved all of its mission objectives. SpaceShipTwo detached from the mothers ship, WhiteKnightTwo, and glided seamlessly back to the Mohave runway. The pilots commented on the smoothness of the both the glide and the landing, and the consistency that SpaceShipTwo delivers every time she flies. The seasonal service to Vail will operate on Saturdays beginning December 14, 2013 until April 5, 2014, using Airbus A319 aircraft offering a choice of Executive or Economy Class service, offering customers the convenience of the only non-stop service between Canada and Colorado's world-famous resorts of Vail and Beaver Creek Mountains. Customers beginning their ski holiday will appreciate the convenience of a mid-day arrival with just a short, 30 min. drive before reaching the slopes. Last month we were hosted by Christine Gaffney, The Travel Designer, our Virtuoso on-site in Scandinavia, for my first trip to Norway. The ninth largest country in Europe, and - incredibly - one I'd never visited! Christine pulled out all the stops, as I know she does for all my clients, to customize a trip that treated us like visiting celebrities. Arriving at Oslo, we stayed at the The Thief, Oslo's newest and trendiest, a part of the Design Hotel group. Among its many features is (according to their insurance broker) the most valuable collection of art in any hotel in Europe! Ask me about artist Fiona Banner's "Lawrence of Arabia" someday! 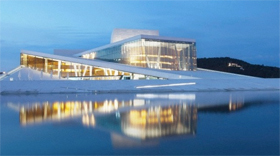 Oslo's many attractions include a new Opera House, an architectural masterpiece that rises from the sea like an iceberg, and encourages visitors to walk all over it, without railings, totally embracing it as their own. Our guides customized our walking tour to include Norway's first indoor market with an extended stop at the Champagne Bodega within! Next we flew to Forde, to the Aamot Country Villa & Opera Farm, a small luxury inn and concert site on the Historic Register, and took a cruise through the fjords. Then on to Bergen, where in addition to a tour of the historic district of Norway's second capital, we visited friends we had met a few years ago on a SeaDream cruise, and dined and slept at the beautiful Solstrand. Then a flight to Aalesund, picked up a rental car, and drove to Troll's Ladder an amazing set of switchbacks high in the mountains soaring above more spectacular fjords. Postcards in the making! Followed the next morning by a drive on the Great Atlantic Road, Norway's Architectural Monument of the Century and considered by many to be the most beautiful drive in the world. A stopover at the old fishing village / restored resort of Haaholmen Havstuer was accessed by a Viking boat ride. Upon our late arrival at Skodje, we were treated to a gourmet dinner served in our suite at the Storfjord. Thence to Kristiansund and a flight to Trondheim, which, at 63 degrees north, might just be the most northern place I've slept, in the largest suite ever at the new Clarion. The magnificent sunset, starting from about midnight, seemed as endless as the hospitality of the people we met at every step of our wonderful visit to this often overlooked, quietly perfect, country that is Norway. Christine is eager to show you the same. Just say the word: Ja! TravelWeek, Canada's Travel Trade Publication, recently ran a profile on me, highlighting my success with the Virgin Galactic project (first passenger space flights planned now for early 2014! Coming aboard?). Read more about me here and about Virgin Galactic here. Dream On: Find out which destinations and travel experiences topped the list in the annual Travel Dreams Survey. Buenos Aires at Its Best: Explore this South American city's culinary, shopping, and cultural scene through a photographer's lens. Taking the Waters: In Stockholm, island-hopping is a way of life. New Zealand Two Ways: Two dream itineraries guide you through this popular destination. Choose your adventure for family fun or a grown-up getaway. Client Interview: Future astronaut Michael Gamerl travels for adventure, perspective, and an excuse to eat Gummi Bears. Quick Escape: From luscious links to beaches worth savoring. Bermuda's flavors entice. Yes, you can book most any hotel in the world by yourself. But did you realize that there are at present 944 of the finest hotels in the world in the Virutoso program, and each and every one of them offers exclusive offers when booked for you by me? Upgrades at time of booking, or upon arrival, are standard fare, as are breakfasts (this alone is sometimes worth nearly the cost of the room in some properties!) and often spa credits and transfers - each property carefully selects their own special Virtuoso Amenities. Some particularly unique amenities my clients receive include exclusive access to sold-out exhibits at the V&A Museum -and- martini making lessons from the The Egerton House; Afternoon Tea -and- complimentary round of golf at Gleneagles; guaranteed upgrade to Club Level at InterContinentals in London, Madrid, and Paris; Chef's 6-course tasting menu with wine at Quito's Casa Gangotena; and while many properties have a once-per-stay amenity, Hyatt Indian Wells (Calif) offers a $100 spa credit DAILY to my clients. 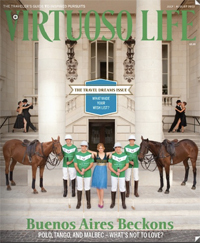 Did you also realize that Virtuoso Rates are GUARANTEED to be equal or lower than rack rates? Not all properties in a hotel group are Virtuoso, but through a Preferred Partner program with many of them, I can arrange similar benefits. For example, only 50 of the 89 Four Seasons Hotels are Virtuoso members, but my Preferred status with the brand can offer many of the same amenities in the balance. I also have Preferred status with Rosewood, Ritz-Carlton, Fairmont, Rocco Forte and Orient-Express properties.